Urban barbecues have picked up steam in the state and may be more central to the history of Georgia Trail barbecue than the hometown places. 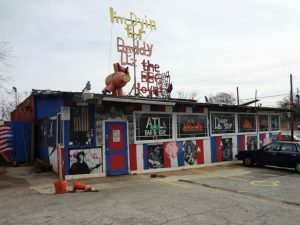 Jim Stacy of Atlanta tells of his favorite joints to fill up on the goods. The Pink Pig: A native of Cherry Log, Bud Holloway grew up in the timber business. He started working in a local sawmill as a young boy. Later, he went into the military. When he returned home he decided to become a truck driver so he could see the country. But when Bud started a family, he retuned to his roots.